Q1. Material Procurement: Where do you get your materials? As we have already indicated in our product descriptions, we put various valuable natural materials to use for our cartridge construction. In the following, we will try to answer the question above particularly regarding organic elements of our cartridges. The question may be simpler explained if we start with the investigation why we are using such materials; The birthplace of TEDESKA handcraft is a small luthier's workshop. Hence the materials, such as wood, bone, nacre, shellac were rather the circumstances, than choices, in which the initial idea was born. And today in turn, they are what can best be handled by us. Since we make our cartridges exclusively by hand, it is also an important criteria for us in the matter of material selection that the materials are supposed to be fully manageable for us without any use of a third party. We have maintained strong professional relationships with a handful of luthiers worldwide. We gladly acquire unusable sections or beautiful residues from them. We do not ask for pieces of threatened or endangered species. As every luthier to comply with all applicable laws and local regulations, we also are fully aware of our obligations. TEDESKA pays great care and uttermost attention to nature preservation. Q2. Material Development: Why do you insist on making wooden cartridge cases? Thankfully, I could become more and more convinced myself over time of the "ingredients" of my daily work. With respect to wood, since I only need very small pieces of wood, I can accomplish my work without being severely affected by their very nature. Instead, the pieces of wood that I am using, offer satisfying lightness and steadiness providing me with various options to form them. Needless to say, there are many materials that are lighter and harder than wood but I haven’t yet found anything which is superior enough to induce me to dispense with the unique beauty of wood. Q1. What makes the TEDESKA mono cartridges special? The original tracking principle of laterally cut mono records (before 1958) involves a stylus that traces the record groove by sideward movements during playback. In all TEDESKA mono cartridge models, the lateral movements of the stylus are converted into rotations by means of a vertical axis generator. Our mono cartridge models are moving coil designs which involve coils that vibrate in a magnetic field. According to the physical principle of electro-magnetic induction, the energy of motion is converted to electrical energy. To achieve a higher output voltage by increasing the magnetic field strength, the coils of most conventional MC cartridge designs are wound on magnetic cores with a high magnetic permeability that guide and concentrate the magnetic field lines. However, the utilisation of magnetic core materials is accompanied by some disadvantages. The induced alternating voltage causes energy losses due to the occurrence of hysteresis effects in addition to eddy currents inside the core. As magnetic cores are considerably heavy due to their high density, they increase the total inertia of the generator’s moving parts. The accelerations, that are created during tracking of the groove, result in inertia forces that act against the movement of the stylus and thus influence a precise tracking. The level of these forces depend on the inertia and on the accelerations itself that increase with the frequency. Finally, all these mentioned factors can have a negative impact on the playback. The cartridges of TEDESKA "Eins" line are equipped with coils without any magnetic core. Instead, they are wound on a lightweight nonmagnetic insulator. These so-called air cored coils thus circumvent the negative aspects that are present at magnetic cores. In addition with the effective utilisation of modern materials, the omission of magnetic cores leads to a lightweight design of all generator's moving parts which reduces the mentioned inertia forces significantly. The result are fast and balanced mono cartridges with various favorable characteristics of sound. They show a wide range of dynamics with considerably low distortion which also becomes apparent for sounds of higher frequencies. Q2. What is the specification of TEDESKA Stereo cartridges? The TEDESKA stereo cartridges are categorized by their tonal color. To generate this color variety, I am experimenting with various techniques and materials. However, I am fully aware that extraordinary techniques or materials by itself will not produce extraordinary sound results. The distinctive tonal color of a cartridge is, I would say, a harmony of the choir of all components. Though from time to time there are moments where a couple of technical modifications or material changes lead to an interesting result. For example, our latest development is the so-called "Solid core" generator which is used within the new DST201ua and DST201ka as well as DST201la model. In this generator, both the rear part of cantilever and the coil core, are made from one piece of solid material. The development started with the simple question how to reduce more partial oscillation. But the restructuring of the core itself was not the end of the task. With the change of the structural properties, the suspension wire, for example, could be fixed in another way; some more drops of adhesive could be saved. The precise manufacturing of this new design and all other corresponding working processes are indeed very laborious. However, this design honoured me with the stiffest possible connection between core and cantilever which results in an improved impulse behavior of the complete generator. Furthermore with these models, as described for our mono cartridge models, we tried to reduce the undesirable aspects of magnetic core materials. We utilize a nonmagnetic and lightweight material that still reduces eddy currents, hysteresis effects and intertia forces. The result of this approach was interesting, even very interesting for me because it sounded unambiguously different from the past performances of our cartridges. Hearing the sound, the very first word that popped into my head was “Impressionist” I wonder what may people say about it. When the stylus tip is running through the groove of the vinyl, the cantilever and the coils oscillate in a magnetic field and electric signals are created. Under perfect circumstances, the oscillations of the coils during music reproduction perfectly correspond to the record groove. This requires that stylus, cantilever and coils are the only parts of the pickup cartridge that may oscillate. However, this is only a theory as in reality a transmission of oscillations to the surrounding parts cannot be avoided. Speaking of the cartridge only, these parts are most importantly the rear pole plate and generator pole (blue in next figure) which carries the cantilever and the coils together with the damping rubber (shown in red). The target during the development of the generator is to achieve a design that avoids any interaction between the cantilever parts and the pole components. In terms of vibration, an interaction takes place when two mechanically connected systems incorporate similar frequencies. To prevent any interactions by separating the resonant frequencies of both components from each other as far as possible, we design the pole components to show resonant frequencies far above the frequency range of our cartridges which is 20 Hz to 35 kHz. 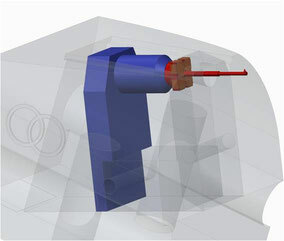 To optimize the pole parts to high resonant frequencies we have incorporated numerical simulation techniques in early design stages. With these kinds of simulations it is possible to determine their resonant frequencies in a virtual manner which enables to investigate geometry modifications in detail. The result of this process is a compact design with high stiffnesses of all parts. In addition we found out that adding a stabilizer to the pole part increases the resonant frequency significantly. The next animations shows the animations of the pole parts eigenmodes with and without stabilizer. Without the stabilizer, the resonance frequency was at 22 kHz and due to the use of the stabilizer it was possible to increase the frequency to 37 kHz. This is a demonstration that the resonances of the pole parts now occur outside the given frequency of our cartridges.